76 mm x 148 mm x 23 mm (3.0" x 5.8" x 0.9"). The label on the back says "Rockwell International. Sumlock Anita Ltd, Uxbridge, England. Assembled in Mexico Primarily of United States components." 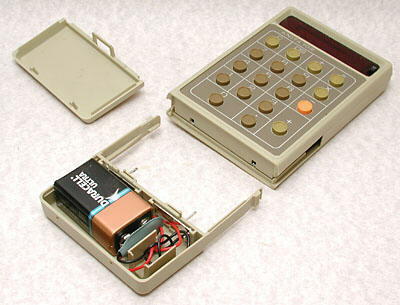 This model has an unusual battery holder which completely detaches from the bottom of the calculator before the cover can be removed and the battery replaced. 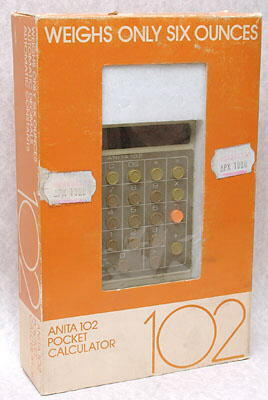 Anita 102 in its box. By the time that this model was made Rockwell had taken over Sumlock Anita and many of the Rockwell calculators were manufactured in Mexico. The label on the rear of the calculator displays "Assembled in Mexico, Primarily of United States Components". This calculator is identical to the Unicom 102 calculator, shown below, and someone has left a reference to the Unicom 102 on the label above. Unicom was the trade name of the calculators manufactured by the semiconductor company American Micro-systems Inc. Like Sumlock Anita, it was bought by Rockwell in 1972 which continued to manufacture the Unicom models for a time. 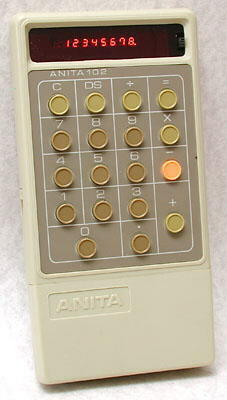 See also the Rockwell-ANITA 1216 desktop calculator. The similar Unicom 102 calculator, for comparison.